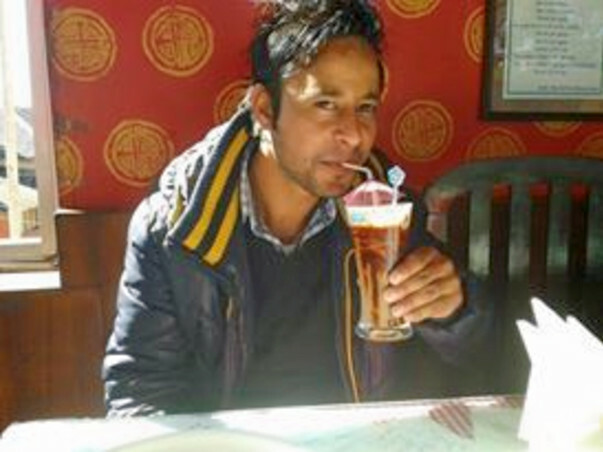 26 years old Sanjay Chauhan is second amongst five brothers and one sister. His father works as a watchman and his mother is a homemaker. Sanjay has been working as a salesman at the United Colors of Benetton showroom at the popular Mall Road in Mussoorie for the past 1.5 years. His income forms a substantial part of the total household earning which is just about enough for the family of eight to survive on. On the night of 13th march, as Sanjay was returning home from work he met with an accident and sustained serious injuries. The details of this accident are still unknown as this happened at a desolate place, late evening and there were no eye witnesses. Fortunately a passer-by noticed Sanjay lying on the road and called for an ambulance. However, by the time he got to the hospital significant time had been lost and his condition had deteriorated. 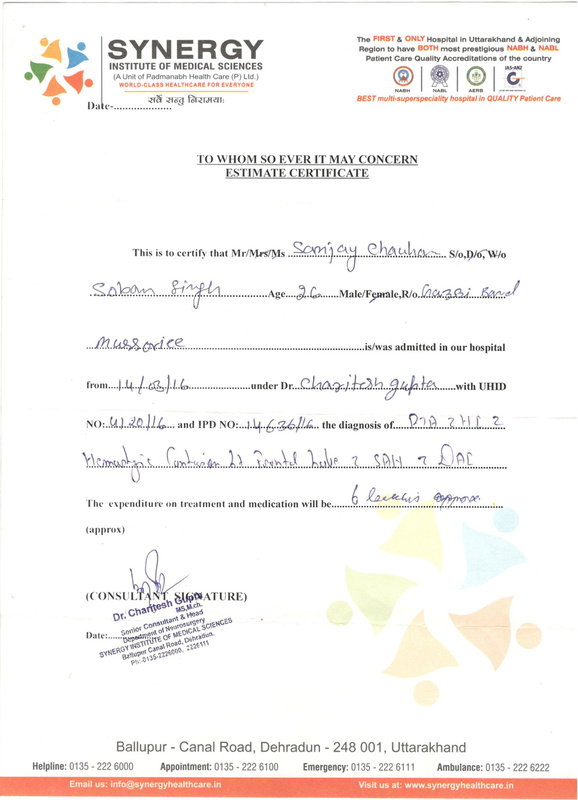 Sanjay is currently undergoing treatment at Synergy Institute of Medical Sciences in Dehradun. He was in coma for 15 days and when he finally regained consciousness, the left side of his body was completely paralyzed. He is being given oxygen support and food is also being given via a tube. He is unable to recognize anyone or say anything. His mother has been staying in the hospital since the day of the accident to take care of him. According to the hospital's estimate, the entire treatment is likely to cost over $ 8000 or over 6 lakh Indian Rupees. Sanjay's family has exhausted all of their meager savings and even sold the few valuables they possessed. The family had lost their home to the disaster of June 2013 that had hit Uttarakhand. Sanjay had taken the initiative and constructed a one room house for them just about a year back and they were barely getting back on their feet when this tragedy struck. 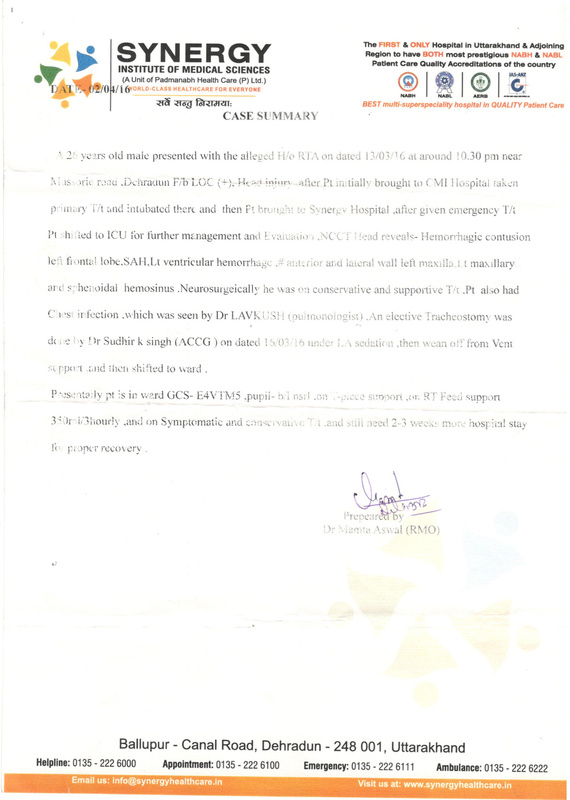 I have also submitted Sanjay's case to the Hans Foundation (http://www.thehansfoundation.org/) for financial and medical assistance and have been assured that at least part of the medical expense the foundation will bear. However, considering the number of cases that the foundation receives daily from around the country, it would be unfair to expect more than that. Hence, I have decided to start this fund raising initiative to help Sanjay and his family through these trying times. 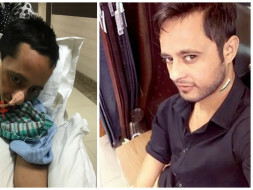 According to the doctors, even when Sanjay gets discharged from the hospital he will need physiotherapy and other assistive care for an extended period of time before he can walk on his feet again. 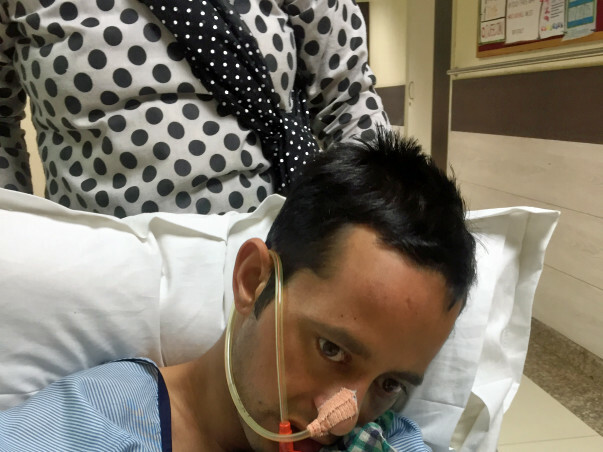 Left to themselves, there is no way that Sanjay's family can afford this treatment and he might end up being permanently disabled. This young happy boy who loved taking selfies and was adored equally by his peers and superiors might never be able to walk again if he doesn't get this treatment. 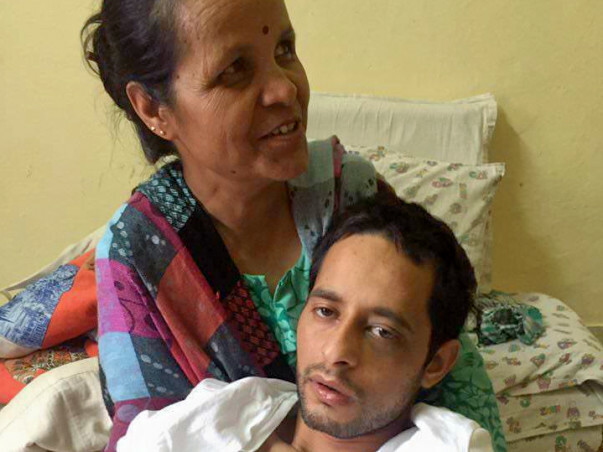 I request you all to please come forward and donate to support Sanjay's treatment. Sanjay is not a relative of mine nor a friend but in the past few days that I have known his family and friends, I feel like I have known him for a long time. I really hope that soon a day will come when I see him walking around and taking selfies just as he used to before his accident . Please help me get him closer to this goal. 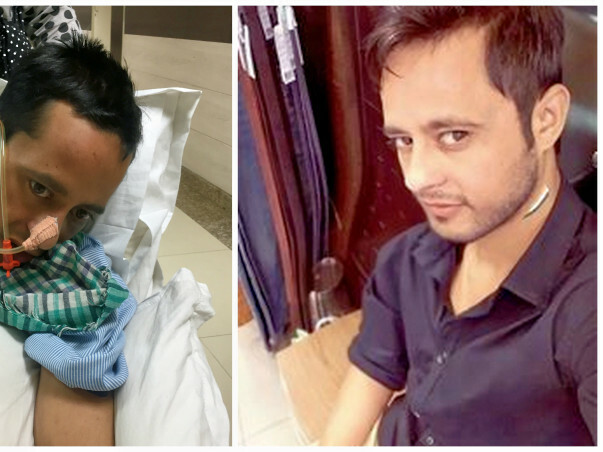 Here's a collection of photos showing Sanjay on the road to recovery. Thank you all for the support and love you have shown Sanjay. I know an update was long overdue. I have been caught up in other things so please accept my apologies for this delay. 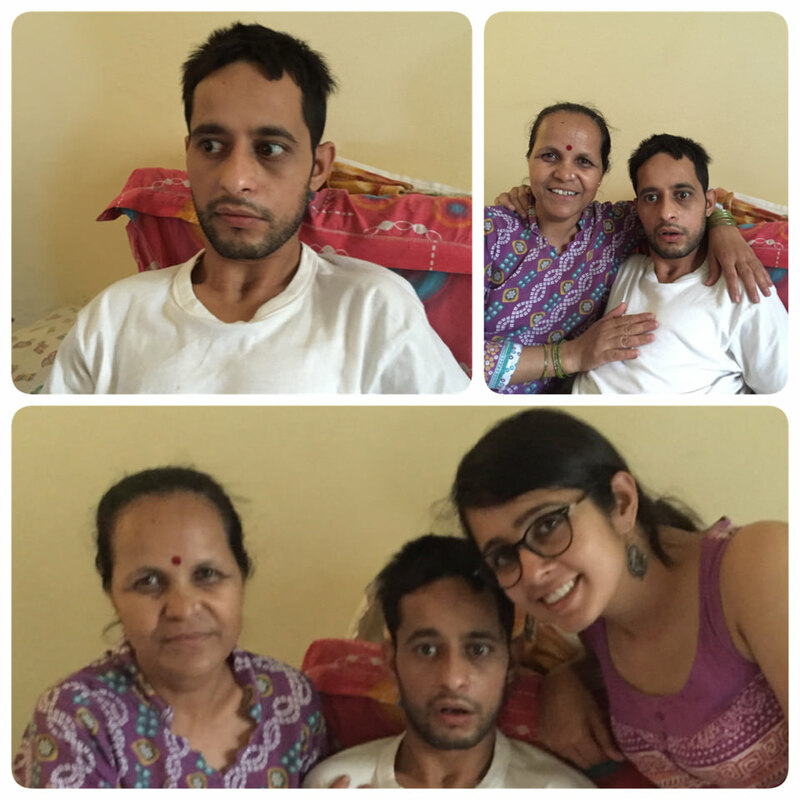 I am very very happy to share that with his medication and physical therapy, Sanjay is making steady progress. Today for the first time, he spoke to me and even recounted how the accident took place. Apparently a speeding car him from behind and he was thrown off the bike. Post that all he remembers is pain. Of course we know that whoever was driving the car thought it was convenient to leave this guy bleeding to death on the road rather than take him to the hospital. Anywho, the point is that Sanjay is recovering well. He is talking; although with much effort. He is clearly anxious about his condition, now that he understands what happened to him. "I am not used to sitting in bed all day", he said. His brothers take him for walks in the wheel chair. He still cannot sit upright without support though. He also has some trouble swallowing food but the doctor says this should improve with time. Meanwhile I suggested that they should buy a juicer and give him fresh juice every day. His mother said she is going to do that so he can get better nutrition. Once again I would like to thank you all for the love and support you have shown towards this campaign. Helping him would not have been possible if each one of you had not been so generous in your contribution to this cause. I will keep you posted of his progress. Thanks to my dear friends Aroon Segan and Aradhna Segan, Sanjay now has a wheelchair which will increase his mobility considerably. It will also be much easier for his mother, who is the primary caregiver, to help him get out of their small room and get some fresh air. Thank you so much for your generosity guys. Sanjay's mother sends her blessings to you both and Ruhan.